Mohan Jodero is tiny store in DLF Phase 4 that's so full of stunning handicrafts from across India that we had trouble clicking pictures (because we didn't want to knock anything down). Diaries, lamps, bottle holders, corner stools, clocks or drawers, (phew!) this store has it all. The fact that they stock so many products, all sourced from around the country and offer a decent variety too. 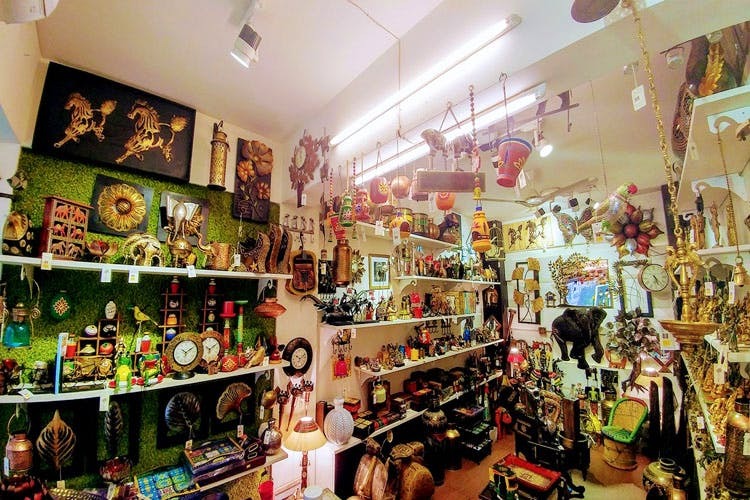 If you've got friends visiting from abroad, direct them to Mohan Jodero, because it's a great place to pick-up Indian handicrafts and souvenirs (think fridge magnets, handmade diaries and photo frames starting at INR 50). For those of us who're re-decorating their house, this store is like Ali Baba's cave. It's got funky utility items like owl bottle holders, balti planters (INR 600), Turkish lamps (INR 2,500), corner stools, kettles (starting at INR 800) and a lot more. Also, we're pretty sure that every time you drop by, you'd definitely come across surprise finds as they're always updating their collection. They've also got a wall full of brass idols of Gods but hey—they're balancing it out with their share of offbeat decor products too. Yay for G-Town folks, as the store is located in DLF Phase 4. But for Delhites, the trek all the way to the other part of town can be a bit too much. They've got a website too, so you can check out Mohan Jodero's products there as well. However, the options on their website are limited, and the collection at the store is actually way more impressive.